Participants were 1003 men undergoing both targeted and standard biopsy concurrently from 2007 through 2014 at the National Cancer Institute in the United States. 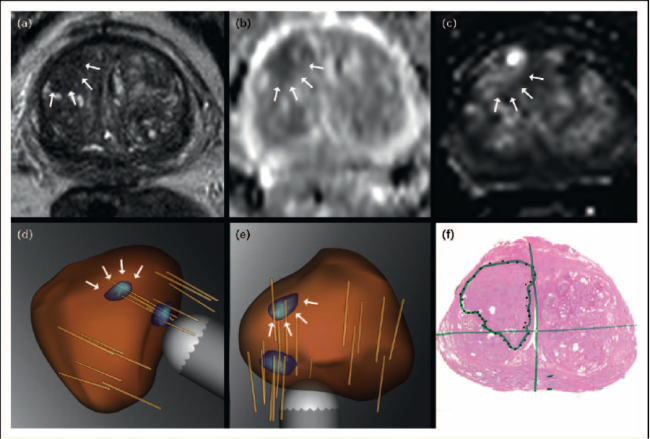 The secondary goal focused on detection of low-risk prostate cancer (Gleason score 3 + 3 or Gleason 7 – (3 + 4)] and the biopsies’ ability to predict the risk of disease after prostate removal and observed by a pathologist. Targeted biopsies diagnosed 30% more high-risk cancers than standard biopsies (Siddiqui et al., 2015). At this point, the notion that you can get a better prostate biopsy with the MR/Ultrasound technology is a no brainer. Men who suspect they have prostate cancer should only be looking for cancer that could kill them. (That’s the more important kind.) For all others, say a Gleason score of six or less, we should “let sleeping dogs lie” as the saying goes. The rub is that it is difficult to find physicians who perform targeted biopsies in the U.S or in the rest of the world. Community physicians are particularly unlikely to perform this newer form of test because there is a relatively steep learning curve, not to mention higher costs, associated with MR/US fusion biopsies. Also, targeted biopsies are a team effort among urologist, radiologist and pathologist. As it pertains to radiologists, the training in performing MRIs and interpreting the images requires a specialized skill specific to prostate doctors. In other words, radiologist who typically looks for cancerous lesions of the breast may be underqualified to find lesions of the prostate. What Should You Do if you need a Prostate Biospy? If you are able to travel and get the right type of prostate biopsy (MR/US guided prostate biopsy), then do so. A regular ultrasound prostate biopsy is, frankly, antiquated right now and may either miss potentially deadly prostate cancer cells (a false negative) or find insignificant non-deadly cancer cell that are not worth worrying about. A cancer diagnosis of indolent cells, while still better than deadly cells, still provokes anxiety. And an anxious life is no way to live. This list is incomplete as I am still learning about groups performing MR/US fusion prostate biopsies. If you are a physician reading this and you perform MR/US fusion prostate biopsy please let us know down at the comment section. Please add Dr. Emilia Ripoll at Choices (www.choicespc.net) in Health in Boulder, Colorado to the list of urologists/urologic oncologists who are using MRI fusion prostate biopsies. Thanks, Mark. Regards to you and Dr. Ripoll. Two weeks ago I had an MRI of the prostate at Park Ave. Radiologists. Last week Dr. David Samadi did a MRI guided biopsy. in his office. The anticipation was much worse than the procedure which took only about fifteen minutes and was not at all painful. I saw Dr. Samadi yesterday and all my markers were clean. What a relief. I told Dr. Samadi that I had seen you. He wants to recruit you to Lennox Hill. Hope you get a raise. Ha. Thanks Michael. Dr.Samadi is very kind. I’m glad your biopsy outcome went well. Dr. Scionti I know well as we worked together for a while here at NYU. He is an amazing diagnostician and focal therapy expert. Thanks, Dan. Dr. Ehdaie is running a study at Sloan on MRI guided biopsies. I am his patient and I am going for the MRI next week. I can’t say anything more about him at this time as I’ve only seen him once. The biggest issue with the guided biopsy is they still take samples from all regions of the prostate besides the suspicious ones as there isn’t enough data to limit it so my biopsy will be 15 samples. Great point, Scott. Targeted biopsy are better, no doubt, but they are still learning what methods works best. The Inspire web site maintains a list of 3TMRI facilities. This week had I was a patient at Desert Medical Imaging for M/P MRI guided forcal laser ablation of a ,7×1.0x1.3cm malignant tumor (Gleason 7, 3plus4) in my prostate, which had been identified with a targeted biopsy several months ago..The proceedure went very well… with no after effects at all .This year I recieve follow up exams….Really impress with this conservative treatment….need to catch these things early……find an office that will do the multi parametric MRI..
Ronnie, Unfortunately I don’t know anyone in that particular area. I sent you and email. I hope you get it. Let me know how me and my team can help. Dr. Geo — Thank you for your site. It would be helpful if you could set the blog and comments to show dates, since I have no idea if I’m looking at info from recent or three years ago or more. As you know, this makes a difference. Also, I’ve been hearing about Dr. Dan Sperling’s center near New York City. Should he/they not be on your list above? My understanding is that they do MR/US-guided biopsy as well as 3TMRI. Hi Andrew, Thank you for the “show dates” comment. I will do that. Dr. Sperling is in Florida now ( he used to be on NYC). Your 4K looks good. My urologist want me to Get an MRI and says it cannot be done without contrast. I am concerned with recent concern over gadolinium deposition possibility with questionable side effects. I am 68 my psa went from 3.5-4.9 in one years time and 4k is “on the high side”. Are you aware of another option/test other than mri that could be helpful to determine if biopsy is necessary? Thank you! I had an MRI-fusion biopsy (16 core) in 2015. All cores were negative. One core did show + DNA methylation (ConfirmMDx gave me a 25% probability of cancer upon repeat Bx and 6% chance of G7 or higher). My PSA has gone up since the first Bx, from 4 to 11. I’ve had two negative mpMRIs on 3T machines. My prostate is 120 cc. My urologist is Dr. William Catalona, one of the top surgeons in the country w.r.t. open prostatectomy. My concern is not in Dr. Catalona’s skills should I be found with cancer. My concern is would I be able to urinate after another Bx given the size of my prostate. My PCA3 was 20. I have DREs four times a year – all negative. My PSA density is under 0.10 and my % free PSA is now at 27% (down from 38%). I’m waiting on 4Kscore results. I want to avoid a repeat biopsy at all costs. I do have a strong family history of PCa. 60 y/o otherwise healthy. Hi Michael. First of all, I have the utmost respect for Dr. Catalona. It would difficult to go against his recommendations. That said, I am super biased against excessive and potentially unnecessary prostate biopsies. While I cannot responsibly diagnose you or give you specific recommendations online, I can generally say that based on the information you offered, you may want to discuss with Dr. Catalona if you can hold off on another prostate biopsy, at least for now. Your prostate is big at 120g – your PSA density is 0.09, favorable. Your PSA of 11 may very well be due to your large prostate. Let us know how things work out for you.